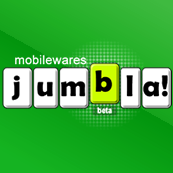 mobilewares jumble! 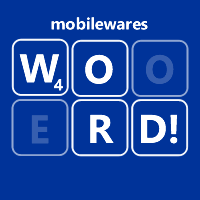 is a fun and addictive word game - designed to keep you hooked for hours - or just provide that moment of relief when you've got a short time to kill. 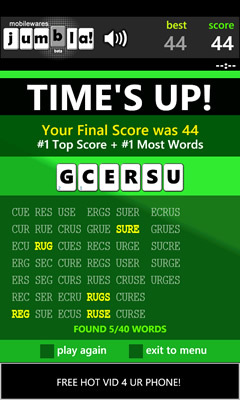 Points are awarded for the highest scoring words (by adding up the value of the letters) - with bonus multipliers applied for getting longer words - and a grand prize if you solve the puzzle. 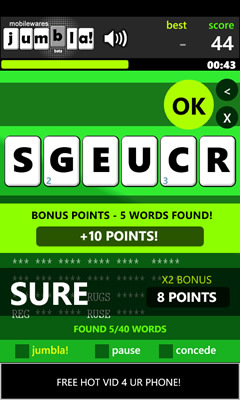 While you're playing you'll also be shown a hidden set of words - so you can see which words you've already found - as well as hints on where else to look. 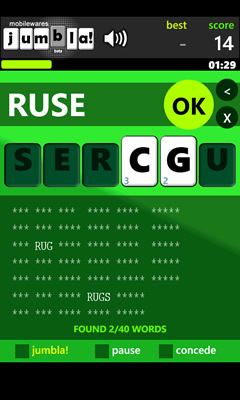 There's over 15,000 built in game sets - with solutions taken from a dictionary of over 180,000 words - optimized for high scores and a challenging puzzle each time you play. 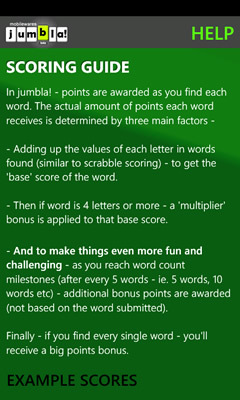 The inbuilt high scores features allow you to keep track of your progress and achievements in jumble. 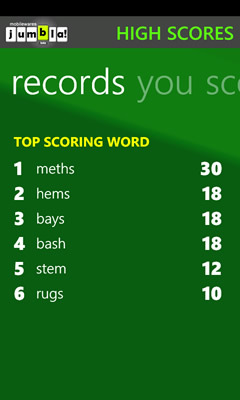 Top scores are tracked - as well as your all time averages - and your top scoring words and word counts. There's also a comprehensive set of inbuilt help to get you up and playing in no time at all! 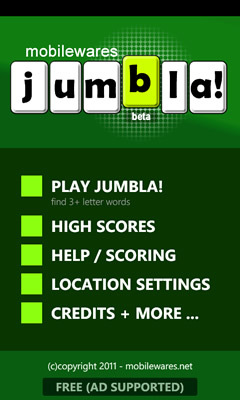 Take up a (healthy) new addiction - take jumble! for a test drive soon - and don't forget it's FREE!.